I am currently on a “restricted diet” aka – watching what I eat, aka – trying to eat healthier so I can lose some weight. Today went a little like this: healthy breakfast cereal with non-fat milk, a Lean Cuisine with a low fat yogurt for lunch, strawberries for an afternoon snack….AND then Arby’s for dinner! HA! Well, so much for that! Not just Arby’s – you know, the roast beef sandwich, smothered in Arby’s sauce – but Arby’s with curly fries – WITH CHEESE! You have to have the cheese! Which brings me to this beauty tonight - Cabot Cheese! 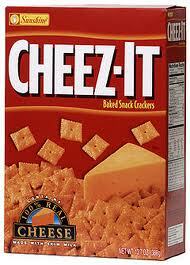 We heard about Cabot Cheese a few years ago and have used the Cheddar Powder for many things. Broccoli – I like you, but Cheddar Powder makes you so much better! Cauliflower – you are good too, but I don’t think I could do it without the Cheddar Powder (okay, well, maybe as long as there is some sort of cheese on you). Popcorn – yum, but cheddar (powder) makes it better! Rice – yes, even plain old rice is great with Cheddar Powder. Cabot Creamery is a “1,200 farm family dairy cooperative with members in New England and upstate New York.”Oh and in case that isn't enough - 100% of their profits go back to the farmers. In addition to Cabot Creamery – they are a big advocate for giving back to the community. They have sponsored various activities/events in ways to give back to their communities. I’ve already told you about the Cheddar Powder that they sell but that is only one in a list of different types of cheese that they sell. They are known for their cheddar cheeses, but they also have a variety of other types. Cabot also makes Greek yogurt (in various flavors), cream cheese, whipped cream, cottage cheese, dips, sour cream, BUTTER (mmmm butter! 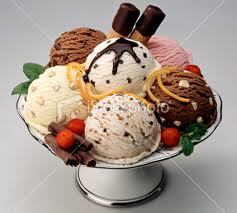 ), and nonfat yogurt. You won’t be sorry if you blow your diet for some of this cheese! 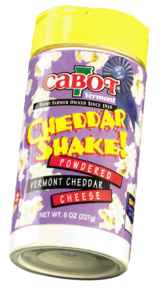 Go to http://www.cabotcheese.coop/pages/our_products/index.php to find a local seller.